Developments within the SICK Flexi family of machinery safety products are delivering more productive and less-costly safety installations that meet the increasing demands of EU safety standards including EN ISO 13849-1 and EN 62061. 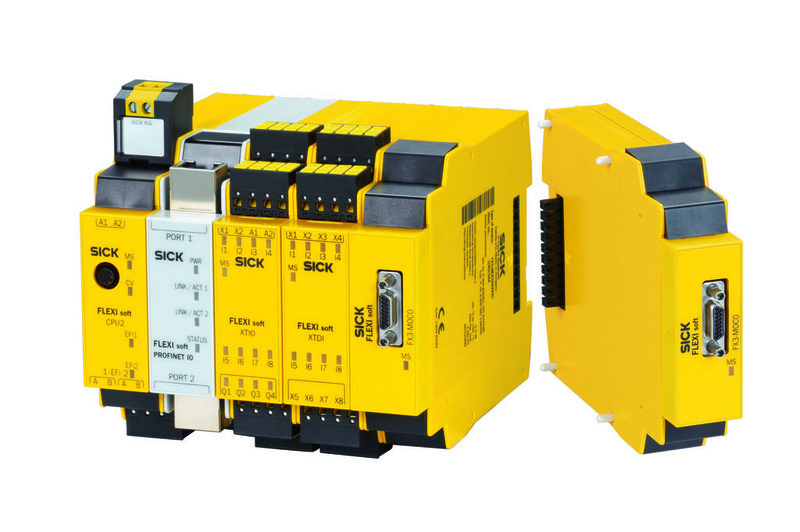 Introducing the Flexi Loop, Flexi-Link and Flexi Line multi-switch and multi-station options to the Flexi Soft plc safety controller modules has opened up new avenues for machinery safety as factories move towards fully-automated central control. They support an increasingly wide range of safety sensors, encoders, light curtains, switches, cameras and laser scanners. “As manufacturers start to exploit the advantages of Industry 4.0 and the capabilities of factory-wide communications, they are demanding that safety systems should match the production speeds and cost savings they achieve,” says Dr Martin Kidman, SICK UK machinery safety specialist. “There’s not much point investing in higher- speed production if safety systems just drag back productivity. “The SICK Flexi Soft modular approach achieves easy integration to create versatile, fully-compliant safety installations. Factory work flow is being revolutionised by features like automatic restart after personnel access and adaptive proximity zones governed by laser scanners."